Images courtesy of LB Art Walk. 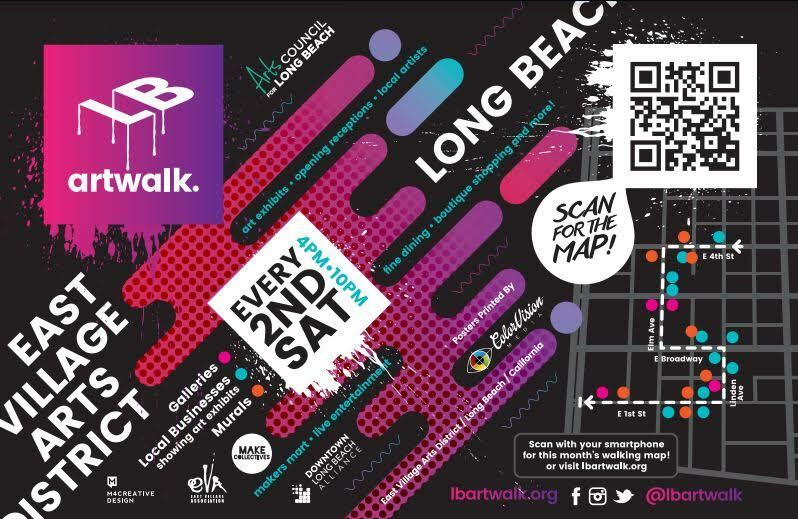 For the past 20 years, the 2nd Saturday Art Walk of Long Beach’s East Village Arts District has made a space for artists to show and sell their work as a street fair. It’s given Long Beach locals and the East Village community a chance to set up shop and show off their creations, all the while bringing foot traffic to the area’s businesses. In June, however, its former organizer, Marek Dzida who owns Hellada Gallery at 117 Linden Avenue, sent out a statement that the art walk could no longer take place due to a lack of required business owners’ signatures needed to continue the street closures on Linden Avenue, 1st Street, Broadway, 4th Street and Elm Avenue. It was then that Michael Mosselli and Marty Meier, owners of Brushstrokes and Beverages at 501 East Broadway, stepped in to create something new. Meier, a graphic designer, came up with a new name, logo and brand for the event. While less street closures will be involved, an online walking map will lead participants to and from the businesses, art galleries and murals located along the new route. Smartphone users will be able to scan a QR code on the poster to pull up the map. Participants can also visit the website to access the map. 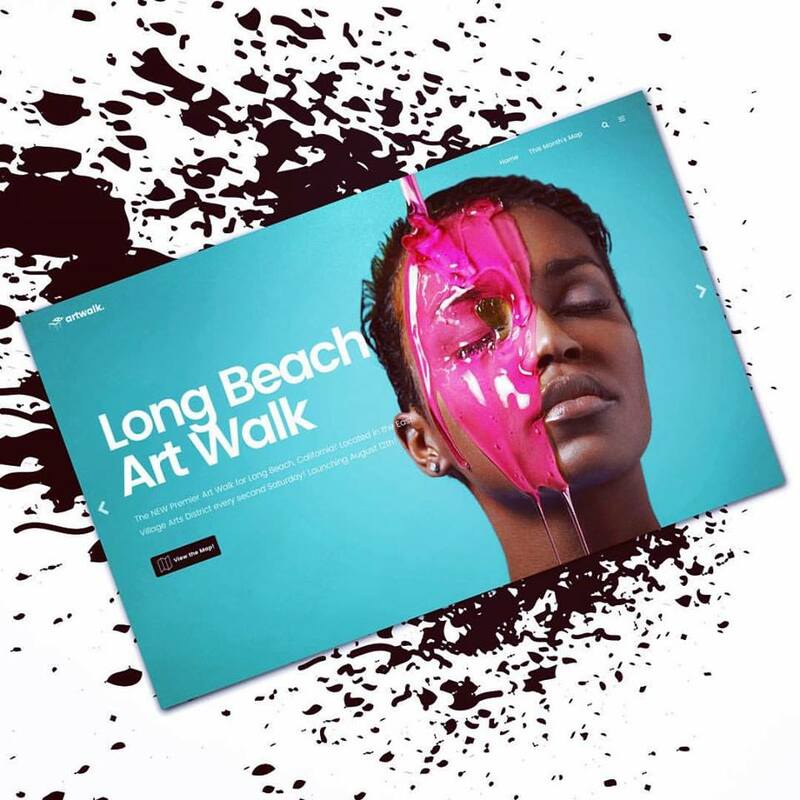 With its bold new look, the support of the Arts Council for Long Beach, the East Village Association, the Downtown Long Beach Alliance, as well as Kat Engal, the owner of Make Collectives who is coordinating a Makers Mart along the route, a new energy has been injected into the two-decades-old event. Dzida, who has run the art walk for the past 20 years and is a believer in continuing the street closures, decided to take a step back after receiving so many responses in disagreement. One of the main issues business owners in the East Village had with closing Linden Avenue was that it created a parking issue. The new plan is to continue to close the street, but only five times a year during October Arts Month, November and December, and likely twice more in May and June. Dzida says taking a step back was a good thing, as the other business owners have stepped up and given the art walk a new life. Certainly the street closures favored the businesses along the aforementioned streets, creating a hub of sorts for pedestrians to congregate. The new LB Art Walk route starts at 4th Street and Linden Avenue, drawing attention to East Village businesses a bit further away from that center. So far, the Arts Council is exploring an ongoing activation of the East Village Arts Park with music as well as finding out how they can facilitate connecting artists with interested businesses. With the East Village Association newly involved, residents are now contributing to the event and making the neighborhood that much more vibrant, Suarez said. Featured events happening during Saturday’s launch include a one-night only exhibit at The Art Exchange, a photo exhibit across the street at The Dark Art Emporium featuring the haunting works of Karen Jerzyk and a new exhibit at Brushstrokes and Beverages showing works emulating the styles of famous artists such as Van Gogh, Monet, Dali and Picasso. Linden Public will be celebrating one year in business with an anniversary party offering drink specials, tapas tasting, giveaways and an art show of its own. Make Collectives will be hosting a pop-up with a new company, THEEGIRL and a Meet the Makers event will take place at Spotlight Gallery. Hops and Vines will also present a musical component with “Hip Hops & Vines: Volume 1”. Eight galleries and 22 business (with more being added) are set to participate, with a route that includes 22 murals. Also included are two activated green spaces, the East Village Arts Park and the 1st and Elm Community Garden. Visitors can also expect live music and food trucks. 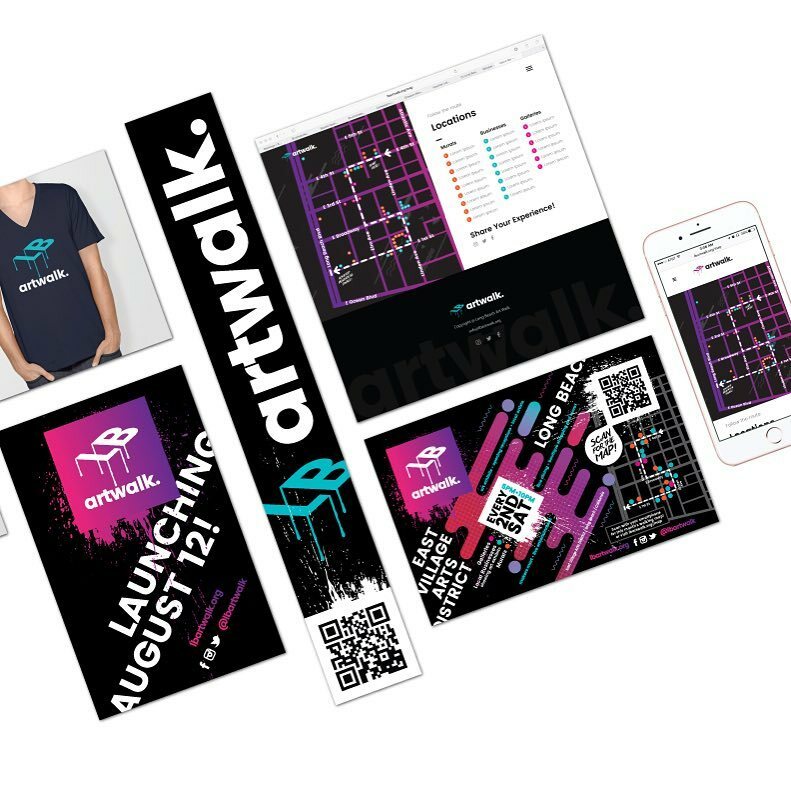 The LB Art Walk will launch Saturday, August 12 and take place every 2nd Saturday of the month from 4:00PM to 10:00PM. For more information, visit the website here, which will be updated monthly with featured locations and events, the Facebook page here and Instagram @lbartwalk.